Ella Gwendoline Rees Williams wrote under the pseudonym Jean Rhys. She was born to a British-Creole family in the British colony of Dominica in the West Indies, and left the island in 1907. She began publishing her writing in the late 1920s. Her most famous work was Wide Sargasso Sea (1966), which won the W.H. Smith Award and the Heinemann Award. In it, Rhys returned to her frequent themes of conflicting cultures, dominance and dependence. Jean Rhys died in Exeter, Devon, before finishing the autobiography she was working on. The incomplete text appeared posthumously under the title Smile Please (1979). 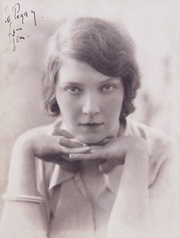 Jean Rhys is currently considered a "single author." If one or more works are by a distinct, homonymous authors, go ahead and split the author. Jean Rhys is composed of 6 names. You can examine and separate out names.